With the unemployment rate high, job loss can happen to you! Most likely it won’t in the short term (the odds are in your favor), but if it does, you don’t want to cut back on your essential expenses. Medical expenses are one of the most commonly cited reasons for bankruptcy or other financial troubles. If you break a leg, you’re going to want to have health insurance. But health insurance only goes so far! That’s why it’s so crucial to ensure that you have an emergency fund in place to soak up those costs. Anything can happen. There are so many more things that can happen other than medical expenses that can drain your bank account. Don’t get caught off guard! The simple idea that you have thousands of money in the bank will help you relax, have less stress, and grant you the ability to focus on what you really need to: your income. 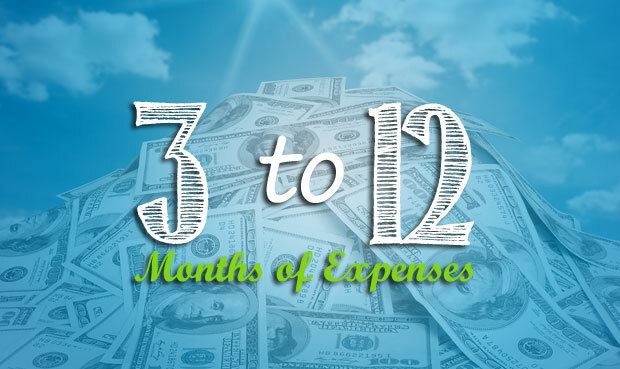 Most financial planners suggest that an emergency fund contain enough money to cover at least three to six months of living expenses but you can also save 12 months worth of expenses or more because it is totally up to you. Note that financial institutions do not carry accounts labeled as emergency funds; it is up to the individual to set up this type of account. Most emergency funds are highly liquid, such as checking or savings accounts. This allows quick access to funds, which is vital in emergency situations. The most basic, but most important concept in financial literacy! Thanks for sharing this. It can never be over emphasized how important emergency funds are. Hi Claudine. If you think it would make sense utilizing your “emergency” fund to cover your expenses after you “resigned”, then of course you can use that. Don’t forget that you’re the one who could best assess your situation and you’re the one who know better what was your primary reason why you saved that money. I hope you have learned something from this article.